This is a summary for Brinley’s 18th week–she was 17 weeks old. She turned four months old this week. year…figures right! Isn’t that the way it often goes! lol). I decided Brinley likely needed longer waketime lengths. There is a great chance that when baby starts taking shorter naps and nothing has changed that waketime length needs to be extended. You of course have other possible factors, like wonder weeks. Despite that obviously going on, I whipped out my optimal waketime chart and started to work on figuring it all out. The last waketime was often 70 minutes. We moved it by quite a bit, so she was definitely ready for an extension. I usually only add 5 minutes at a time. During the day, I usually just have Brinley in socks and a shirt. She sleeps all swaddled up so the pants can be too hot. Once she had longer waketimes, however, I realize she needed pants on during playtime. She would get fussy after a while and her legs would be cold. So I put pants on her either before or after she nurses and she is much happier. Then I take them off at nap time. After the wonder week seemed to have left, she started being much more capable with her hands. She reaches purposefully and grabs toys now. She is no pro–still an armature but she is doing it. She also finally laughed at me! And quite a bit. She found me quite amusing. Oh how I love those baby laughs! Oh yes! We started solids. She was so incredibly ready for it. I hadn’t wanted to necessarily until after Christmas because once solids are started, you have to bring solids with you when you go places. The girl, however, was so very ready to eat. She would lean toward food with her mouth open whenever she saw it. I happen to love feeding babies food, so her wanting it so much meant I was sold on the idea. I took a very ripe banana and cut it in half. I peeled it and smashed it up in my Kidco Deluxe Food Mill, mixed it with some breastmilk (one tablespoon) and fed it to her. She was in heaven! So was so happy. And so good at eating. She had it down immediately. She ate from the spoon and swallowed it very well. She also has very obvious signs of being done eating, which is great. She just starts saying, “Ehhhhhhhhhh” and looks away. Did I mention my hair has started to come out in large quantities? If this is your first baby, don’t worry! It is normal! You don’t lose any (or just small amounts) during the end of your pregnancy and into the first few months after delivery, so it is totally normal. Kind of annoying, but normal. I still give Brinley gas drops after every feeding. Supposedly I want to drop the dreamfeed this month. I don’t know. 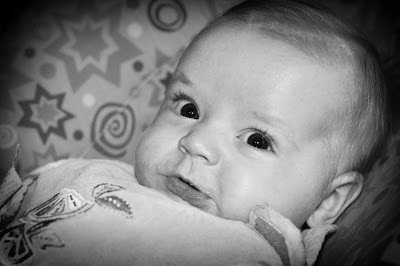 I had that in my mind (after saying three months old…) and now that four months old is here, I am not so sure. Now five months old sounds nice. But I can’t put off forever. So it might happen this month. I do plan to drop the swaddle sometime this month. I think it is highly likely that will happen this month. We will continue to slowly introduce solids. Our schedule was more normal this week. I am not sure what is "most common." I know this schedule has been common for my girls. I think so long as bedtime happens at the right time, it is fine. That's interesting about the fussiness and leggings. I noticed my LO is reliably fussier if I have her arms and legs exposed, and we live in Brisbane, Australia, which is a very warm and humid climate. I now keep her in full sleep suits or leggings and long-sleeved top all the time, but no singlets, and she's much happier (now 5mo). I wondered if anyone else experienced this. I passionately despise being cold, so she's obviously inherited that from me! That is interesting that she is good at eating from a spoon right from the start. Sounds like she was eager to start! If I remember right, Brayden ate well right from the start too. My boys liked starting to eat solids, but definitely had a small learning curve. I love reading your and learning more about how to implement BW theory, so thank you! I could really use some advice. I've got a 12wk old who isn't yet sttn and I can't understand why. I've had her on a tight 2.5-3hr routine since birth and started to reduce her 1 middle of the night feed over 5 nights from 10wks, then used a dummy whenever she woke (4 times, then reduced to 2)and 4 days later she slept through. She then became ill with Bronchiolitis and 10 days later, we're having to start all over again :(. I've tried taking the night feed away and over the past 4 nights she woke 2-3 times each night. Should I go back to one night feed and slowly reduce? Am I expecting too much from her? I have looked more at her day time schedule, and stopped waking her as she has needed to be woken for 2-3 of her feeds, so we're now feeding more 3 hrly, until 1pm, then 2-2.5hrly until bedtime (7:30pm). So haven't quite dropped the 7th feed yet due to not sleeping through and my wanting to feed her up. Any advice is greatly appreciated! Remember, "foods before one are just for fun!" Starting at 17 weeks is super early by all the guidelines out there. I know you usually don't have trouble with your milk supply, but you may want to be cautious that you are nursing frequently enough to keep the bulk of her calories from breastmilk and keeping enough night nursings in for her optimal growth. hi ive been following this blog since i read babywise while pregnant and was hoping someone could offer advice:my 18 week old's sleeping habits are getting worse, not better! she has only slept a five hour stretch 3 times-ever. usually she goes to bed at 8, wakes at 11, 1/2, 4/5 and 6:30/7. But lately she is refusing to go to bed till 11pm. Crying and whining from 8pm to 11pm though she is clearly tired. She is also waking more frequently at night and needing her pacifier (she had stopped doing this at 2months but its back) aside from the times she wakes up to nurse. I've been following eat, play, sleep on a 3hr schedule so im not sure where the problem is. when things started getting worse i thought maybe 4month sleep regression but i dont think it should last this long. ive let her cry for 5-10mins but she has just turned red and turned hysterical. ANY TIPS? What am i doing wrong? Do you not start feeding your kids baby cereal first? you got straight to the good stuff?? Would you, at this age let her cry it out in the middle of the night or feed her? I'm having a hard time letting my daughter cry for soem reason (wasn't this way with my son).